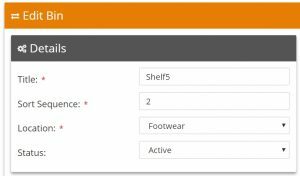 This entry was posted in Delivrd HowTo, Guides and tagged import, inbound, multi-location inventory management, on boarding, products, sku on September 10, 2017 by Areyeh Ben Barak. After signing up to use Delivrd inventory management software you will need to import your products into the system. 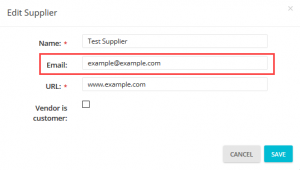 This can be done by importing a CSV type file into the product database. Maximum file size for uploads is 100 KB. You can upload only CSV files. Click here for an explanation of the fields. Click on the Import Products from CSV file button as shown below. After doing so you will be taken to a different screen where the actual import action will be implemented. Click on the +Add File button in order to browse to your source file’s destination and select it. In order to start the uploading process once the file has been uploaded you can click on either the Start Upload or Start buttons as shown below. 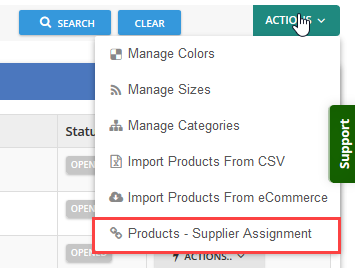 After the file has been successfully uploaded it is now ready to be imported into the Delivrd system by clicking on the Create Products button as shown below. 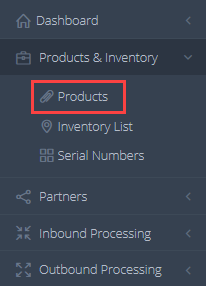 After the file has been imported successfully you are taken directly to the Products List page so you can view the imported products directly. 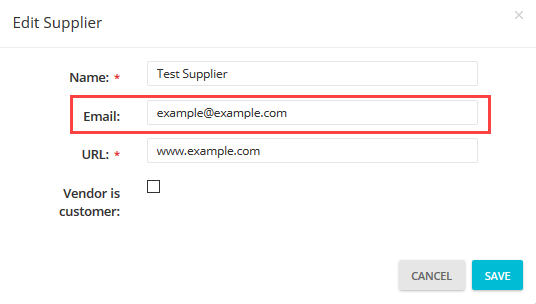 You can download a sample source file and insert your data into the relevant fields which can then be imported as explained previously. Explanation of the fields that can be imported. If you keep your product inventory in multiple locations in your warehouse you can manage their quantity and distribution in fulfilling customers’ orders with Delivrd’s Locations. This can be done by the accessing the Manage Locations option via Products & Inventory → Inventory List → Actions → Manager Locations as shown below. After clicking on the Manage Locations option you will be taken to the Locations management screen where you can add a new location as shown below. When clicking + New Location, a new window opens in which you will add the locations details. There are two available fields, Name and Description. 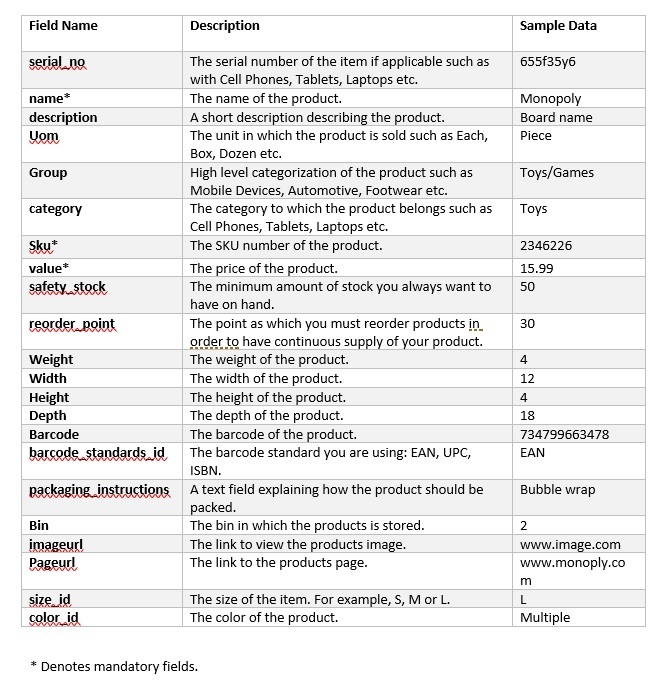 Name is used for naming the location of the products and Description to describe in short detail any relevant information as shown in the example below. This says the items that the customer ordered can be found on the second shelf in the north east side of the warehouse and that each order is fulfilled by one box of product. After filling in the fields with the correct data you can save the information by clicking the green Save button. 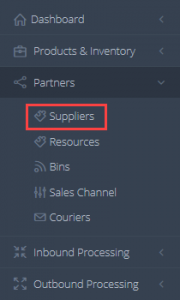 In a few simple steps you can start managing you products inventory in the Delivrd system. This entry was posted in Delivrd HowTo, Guides and tagged multiple, order, release, sales on August 29, 2017 by Areyeh Ben Barak. You can now release multiple sales orders, from your inventory, at one time via the green Actions button in the top right corner of the Sales Order page. In order to use this feature you need to select the orders you want to release by ticking the boxes next to all the orders you want to release in the pound sign column (#). After selecting the items you want to release go to the green Actions button in the top right corner. Then select Release All Orders option. After the orders are released only the orders that were not selected will remain. This entry was posted in Delivrd HowTo, Guides and tagged inventory, inventory control, inventory count, inventory management, overdue, reorder point, replenishment, replenishment order, safety stock, shipment, stock management on August 22, 2017 by Areyeh Ben Barak. There is now a new Dashboard look which gives you more important information in one glance so you can manager you inventory better and more efficiently. 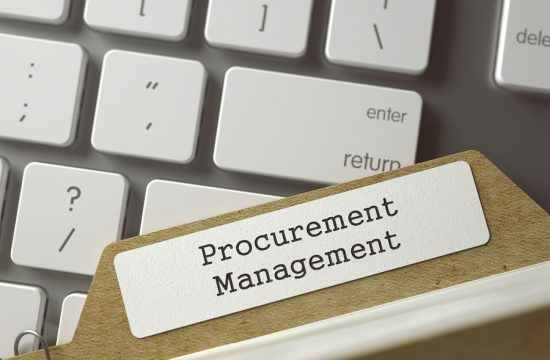 Sales Orders to Fulfill – These are orders that have been set to a Released status but still needs to be fulfilled for the customer. Shipments Awaiting Pick-Up: The Pick and Pack step has been finished and the orders status has been set to Completed and is awaiting pickup by the delivery company for shipment to the customer. Overdue Purchase Orders: These are orders that have not had their status changed to Released or the processing of the order has not been completed in the last 30 days and is overdue. 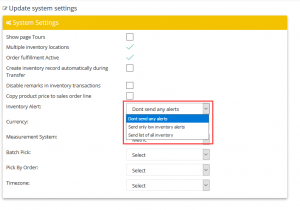 Inventory Alerts: Items that have reached their Reorder or Safety Stock levels and need to be replenished as soon as possible in order to continue conducting business in a timely and efficient manner without losing customers. 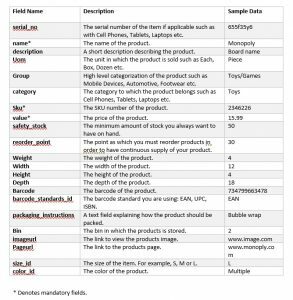 This entry was posted in Delivrd HowTo, Guides and tagged bin, inventory management, multi-location inventory management, order picking, pack on August 21, 2017 by Areyeh Ben Barak. With Delivrd you can now manage Bins. Bins are the location in which your products are stored so that can be picked by your fulfillment individuals and control your inventory location. To add a new Bin simply select the “+ New Bin” button. The below page will appear. Title: The name of the Bin itself. 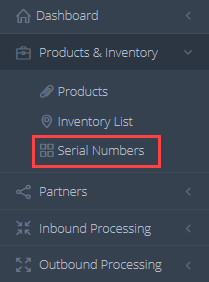 Sort Sequence: The order is which the picker would select the items when fulfilling an order with multiple items. Location: The physical location of the bin in the warehouse, store, etc. Status: Active or Inactive. Is this Bin being used currently or not? 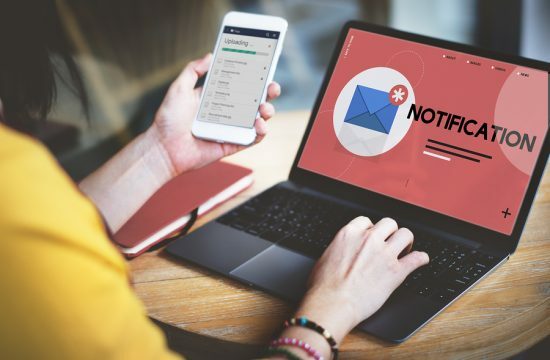 For example, the Bin might not have any products in it now and is not in use, so the Inactive status would be set until it’s been resupplied with items to fulfill an order. Please note: If no status is selected the default status of Active will be chosen automatically. This can be changed later if you so choose. It is also possible to load the Bin data via a CSV file. This entry was posted in Delivrd HowTo, Guides and tagged alert, inventory, inventory management, reorder point, replenishment, safety stock, stock management on August 17, 2017 by Areyeh Ben Barak. Knowing when your product stock is running low is an key part of inventory management. In Delivrd is now possible to view only the items that are below their Reorder or Safety Stock levels. 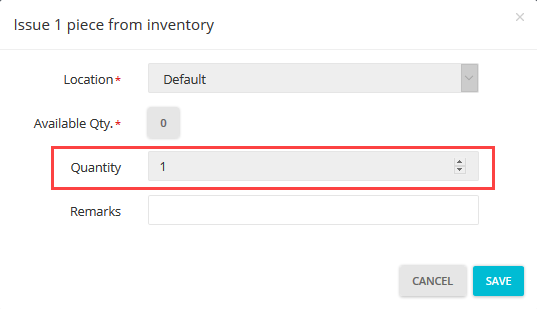 In the Dashboard page you can see the Inventory Alerts box. The number shown there represents the items that have reached their Reorder or Safety Stock levels and needs to be replenished or reordered as soon as possible. For example, shown below are all the items that are in the system currently. Note that there are four items showing that their stock is running low; highlighted in yellow and red. This is reflected in the Dashboard under the Inventory Alerts box. 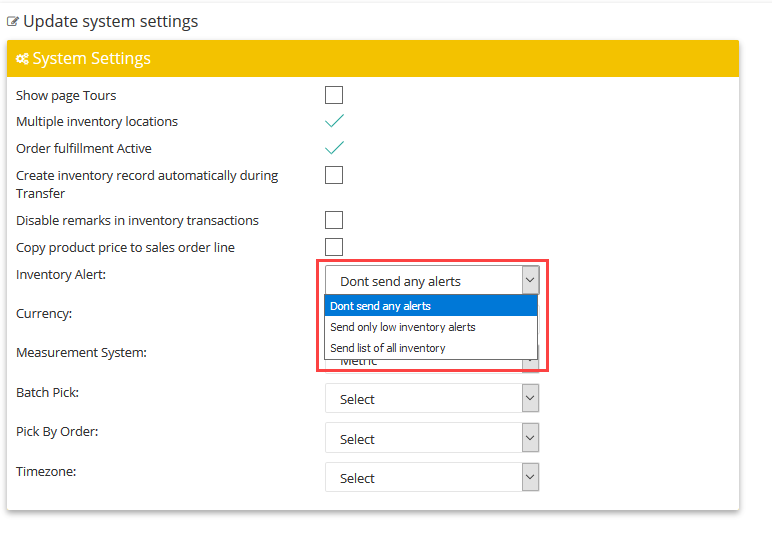 After clicking on the Inventory Alerts box you are taken to a new page showing the exact items that require your immediate attention. You can now view all of your products that are running low or need to be reordered soon at a single glance!!! This entry was posted in Guides and tagged inventory on May 16, 2016 by delivrd.